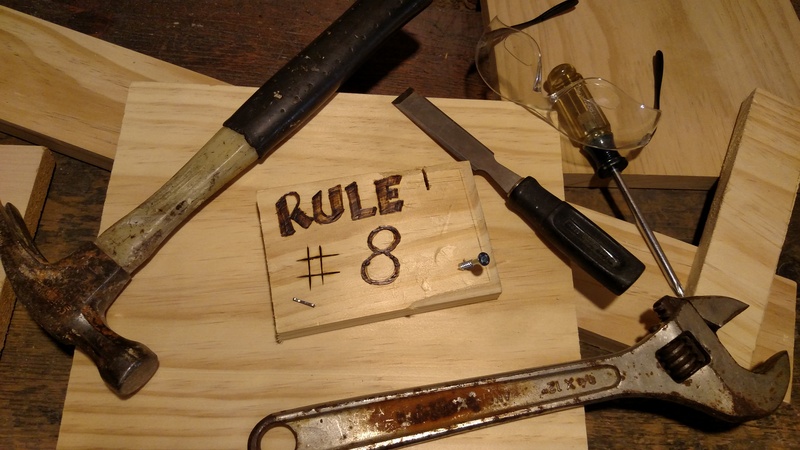 Rule #8. Possessions are never impressive because they are purchased, but rather because they are used. So often people get caught up in material things. Too often we are a culture of people who seek fulfillment through the acquisition of more stuff. It may be true that after awhile the things that we own start to own us! There is something to be said for minimalism. But there is also something to be said for having stuff. Not because of status or prestige. Not because having a new item will make us happy. Not because having lots of stuff will give us a sense of fulfillment. No, it’s much simpler than that; sometimes, having stuff enables us to do stuff. But just as a story should always serve the experience, a possession should always serve its owner. A fancy turntable is meaningless if you never actually play your records. A library full of books is worthless if you do not read them. A cast iron skillet is a waste of space if you never cook. A table saw only collects dust if you don’t use it to build things. We buy these things for a number of reasons, but sometimes we acquire stuff to impress someone; often times we’re even trying to impress ourselves. Too often we think if we buy this stuff it will impress upon us the characteristics we think we should have in order to make us the person we think we ought to be. But ask yourself, do I really want to listen to records, read these books, cook in this skillet, or build something? I hope the answer is yes. Maybe you haven’t yet because you’ve been waiting for permission. Well, don’t wait anymore, just get started. But if you asked yourself those questions and realized that you don’t want to do those things, it’s time to let go of the stuff. The items aren’t impressive, the activities are. So don’t waste your time trying to make yourself like things you don’t like. Instead, seek out new things to try. Not everyone likes to read the classics; some people read comic books. Do what you enjoy. Definitely keep trying new things, and even give them a second chance. But if you don’t like something, don’t beat yourself up about it. Love doing the things that you love doing. It’s important to remember that you own your possessions, they don’t own you. An ultralight backpacking tent is awesome, but not if if sits in your basements and never sees use in the wild. That’s how it is with almost everything. So think about the things you own; are they serving a purpose in the adventure that is your life? Are you using them to facilitate action? If not, it may be time to consider letting them go and trying out some new stuff. If you’re not using your possessions, do they serve a purpose? It’s okay to own things, and it’s okay to buy things. But don’t waste your time and your money on things that you won’t use. Think twice before you buy something. Ask yourself, “is this something I’ll actually use?” Every possession isn’t just money spent; there is always opportunity cost as well. There are only so many dollars you can earn, and only so many hours in a day in which to earn them. Make sure that when you spend both on possessions that they’re things that you need, want, and will give you a great deal of good use!